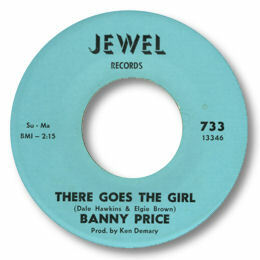 Now that the lively blues of “You Love Me Pretty Baby” with its Otis Rush influences has been discovered by the dance crowd it’s appropriate to remember that Banny Price cut a much better side. There Goes The Girl is a fine plodding number with some superb harmony vocals (Dale Hawkins?) and a fiery horn section. It had been a deep soul sleeper for years, sought after but not often heard until I featured it on a UK CD. All his Jewel sides – like so many Shreveport releases of the time including tracks by Eddy Giles and Reuben Bell for Murco – were cut at the Robin Hood studios in Tyler, TX. Price made his living as a Louisiana blues singer and guitarist, recording some unissued sides for Myra Smith’s Ram label as well as the singles for Jewel. 1. “There Goes The Girl” can be found on the Westside UK CD “Soul Jewels Vol 2” (WESA 913). 2. “You Love Me Pretty Baby” can be found on the Kent UK CD “New Breed R & B With Added Popcorn” (CDKEND 291). 3. One of Price’s unissued Ram tracks “Rushin’” can be found on the Ace UK CD “Red River Blues” (CDCHD 725).